World Record Largemouth Bass -- 22 lbs. 4 oz. Kingdom: AnimaliaPhylum: ChordataClass: ActinopterygiiOrder: PerciformesFamily: CentrarchidaeGenus: MicropterusScientific name: Micropterus Salmoides. Colloquial names include black bass, 'ole bucketmouth, green bass, green trout (WHAT?) and linesides. Usually, these big game predators are a dark green to almost black, and have dark "stripes" running along the side flanks. The mouth is the easiest distinguishing characteristic of this bass. It is overly LARGE (duh! 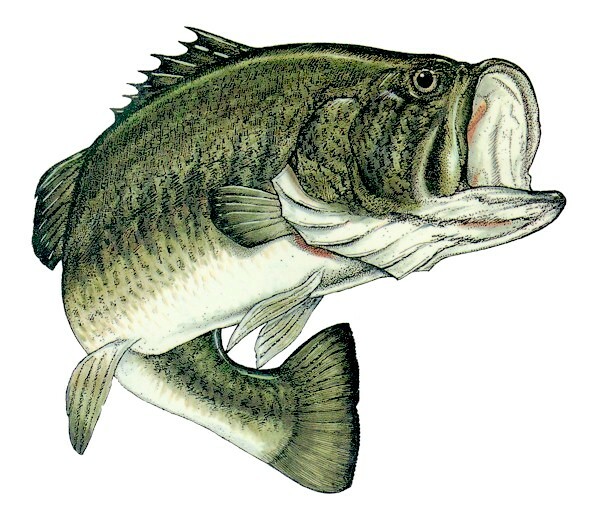 ), hence the name "largemouth" bass. Just about any fresh water with adequate cover foliage can hold largemouth bass. They are probably the most populous game fish that have ever existed. Lakes, ponds, streams, and brooks have been known to produce these fighting monsters. They are native all across the USA and into Canada. I am sure they are plentiful elsewhere too, but I tend to fish here in the good ‘ole USA. Largemouth will hang out in areas of heavy cover like underwater grass, structures, and especially lily pad fields. This helps them in their hunting and feeding habits. It also helps YOU know where to look for them! 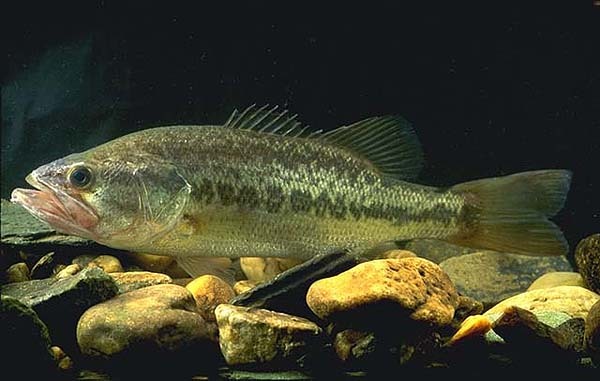 Largemouth Bass can grow to a maximum length of about 30 inches (the world record was 38") and weigh up to 25 pounds. 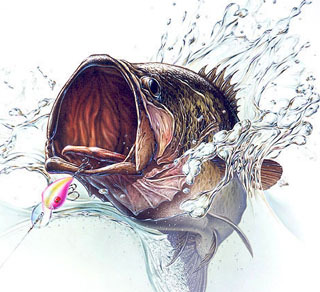 "Lunker" is a term attributed to any fish over 5 or 6 pounds. Compared to other types of fish, the largemouth does everything fast. The female lays eggs in several nests between June and August. The male guards the nests and fans them with his tail until they hatch 4 or 5 days later. Pretty quick, huh? A single female will produce around 5000 eggs. Sadly, only about 10 will reach a significant level of maturity.NOTE: After maturity, the parents are known to eat their own young in feeding frenzies. Largemouths are predators that eat other animals throughout their life (10 to 12 years). They will eat anything that is smaller than they are, so they are kind of a bully. Larger fish will even take other bass, small waterfowl (birds), crawdads, beetles, and big frogs as food. Being the king of the water where they live, they eat whatever and whenever they want. Feeding usually is at its highs during the early morning (while it's still dark) and at dusk. This is so they can hide in the weeds and watch other aquatic creepies go by. When it sees what it likes, the largemouth STRIKES! Largemouth can be cooked in so many different ways, I cannot even begin to discuss it here. Every way from the old standard pan frying to smoking, the largemouth is a very tasty fish. The meat is firm and white, and holds up well to grilling as well as broiling techniques. Other species like this one and their differences. Sometimes, the smallmouth is confused with the largemouth. One look at the mouth size will tell the story. I mean, really, think about it. Largemouth and smallmouth. What do you think the difference will be? Young largemouths MAY be mistaken for bluegill or crappie at times. This is an error made by inexperienced anglers, though. Of course, present company excepted!! Pound for pound, the largemouth is one fighting, thrashing, hook bending adversary for any angler to hook onto. P.S. IF YOU ARE A BEGINNER TO LARGEMOUTH BASS FISHING, PLEASE READ WHAT THE FOLKS AT Bass-Fishing-Beginner.com HAVE TO ADD TO YOUR BASS FISHING EXPERIENCE. THEY UNDERSTAND HOW TO SIMPLIFY THE PROCESS AND MAKE LEARNING FUN.